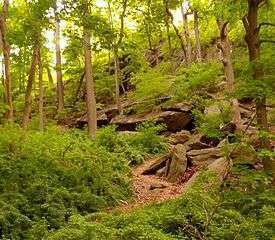 Upper Manhattan denotes the most northern region of the New York City Borough of Manhattan. Its southern boundary has been variously defined, but 96th Street, the northern boundary of Central Park at 110th Street, 125th Street or 155th Street are some common usages. 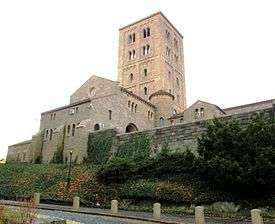 Upper Manhattan is generally taken to include the neighborhoods of Marble Hill, Inwood, Washington Heights (including Fort George, Sherman Creek and Hudson Heights), Harlem (including Sugar Hill, Hamilton Heights and Manhattanville), and parts of the Upper West Side (Morningside Heights and Manhattan Valley). 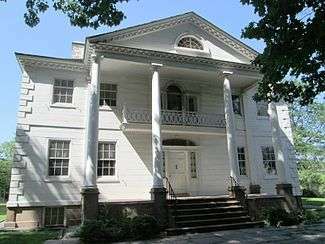 Like other residential areas, Upper Manhattan is not a major center of tourism in New York City, although some tourist attractions, such as Grant's Tomb, most of Riverside Park, the Apollo Theater, Fort Tryon Park and The Cloisters, Sylvia's Restaurant, the Hamilton Grange, the Morris–Jumel Mansion, Minton's Playhouse, Riverbank State Park, Sakura Park, Sugar Hill, Riverside Church, the National Jazz Museum in Harlem and the Dyckman House lie within it. 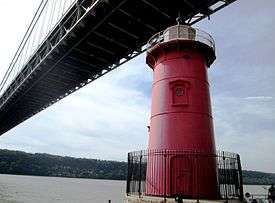 The Little Red Lighthouse under the George Washington Bridge. The bridge connects Washington Heights in Upper Manhattan across the Hudson River to Fort Lee, New Jersey, and is the world's busiest motor vehicle bridge. ^ "Port Authority of New York and New Jersey - George Washington Bridge". The Port Authority of New York and New Jersey. Retrieved September 13, 2013. ^ Woodruff, Bob; Zak, Lana & Wash, Stephanie (November 20, 2012). "GW Bridge Painters: Dangerous Job on Top of the World's Busiest Bridge". ABC News. Retrieved June 6, 2016.